As Catholic parishes throughout Australia prepare to celebrate Sea Sunday on 9 July 2017, it is timely to reflect on the vital work of the tens of thousands of seafarers who visit our ports each year – and the ministry of the Apostleship of the Sea which supports them. Lindy McNamara* reports. Life at sea for crew members aboard a cargo ship or fishing vessel can be a lonely existence at times. Separated from family and friends for months at a time, often working in dangerous weather conditions, there is little wonder that feelings of isolation and depression are common. However, the Apostleship of the Sea Catholic ministry (AOS) offers a ‘beacon of light’ to seafarers around the world by providing pastoral support for their ‘spiritual, social and material’ welfare. In Australia there are 15 AOS port chaplains / centre managers and more than 160 volunteers supporting the estimated 130,000 seafarers who transit the nation’s 25 ports each year through these centres. On July 9, Catholic parishes throughout Australia will celebrate Sea Sunday, when parishioners will be asked to keep seafarers and their families in their prayers and collections on the day will go to support the AOS ministry. With almost 90 per cent of trade being transported by sea, the maritime industry plays a vital role in the world economy. 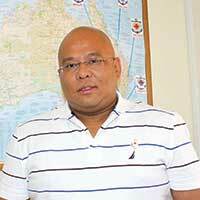 AOS Australia interim national director Father Roger Manalo CS said the collection was a way of thanking the seafarers for their work in bringing goods that “benefit all Australians”, while also supporting the “much needed” work of the AOS chaplains and volunteers. “Working on ships can make these people feel isolated and depressed – even more so when the weather conditions are less than ideal. Fr Manalo added the role of the AOS had changed over the years in response to advances in technology. Automation means cargo ships can now be unloaded in a matter of hours, compared to several days previously, and consequently seafarers were in port and able to access AOS services for only a short time. “They might be here for only 6 to 24 hours. When they arrive they want to feel welcomed. They have been on the high seas for say 30 days and just seeing the other 10 to 15 crew on board, and so they want to be able to communicate with their families using wi-fi or telephone. “The Catholic crews of the cargo/container ships are predominately of Filipino or Indian origins and often they ask for Mass, a blessing of the ship, or confession. Mostly, seafarers like to be taken to places where they can shop and access other things not available on board,” he said. As part of its mission, the AOS also looks after seafarers who are abandoned in port and those who are sick or injured through accidents. The Filipino-born priest, who is based in the Adelaide Archdiocese, said taking over as the interim director provided a strong connection to his family and home country, and his calling as a Scalabrinian. “Some of my uncles and cousins have worked in the maritime industry for many years. I remember that 20 years ago some of my uncles were away from the family for three years and I didn’t see my cousin for three years because he was away at sea… so I guess that helped nurture my interest in the AOS,” he explained. As interim director, he sees his role over the next year as “listening” to the bishops, chaplains and volunteers and helping to “prepare the way” for when a national director is appointed. This entry was posted in Bishops Commissions, Special interest and tagged Australian ports, Catholic parishes, Sea Sunday, Seafarers on July 7, 2017 by ACBC Communications.